Warning, the following post is a deep dive into the latest episode of Game of Thrones, “Beyond The Wall”, and there will be spoilers aplenty. If you *still* haven’t seen the episode, well, what are you waiting for? As Season 7 of Game of Thrones prepares to wind down (with a nail-biter of a season finale, mind you), it seems as though the show is, in many ways, coming full circle. Now more than ever, fleeting moments and promises from the first few seasons have become relevant and the show is even drawing a *lot* of parallels to the penultimate episode of the first season, “Baelor.” Vulture wrote an incredible breakdown of everything tying “Beyond The Wall” back to “Baelor,” and we have to admit, the parallels between Jon Snow and Khal Drogo are more visible than ever. After Dany flies her dragons beyond The Wall to rescue Jon and his men from the overwhelming army of the dead, Jon appears to sacrifice himself so she and the rest of the men can flee. Naturally he manages to survive the encounter — barely — and manages to return to Eastwatch, hanging on to the back of a horse, clearly succumbing to a hypothermia of sorts. As Davos peels off his frozen clothing, a worried Dany gets her first good look at Jon Snow and all his scared, formerly dead glory. It wasn’t until we saw Daenerys Targaryen watch an unconscious Jon Snow in last few minutes of the episode that we realized we’d seen this before. During the Episode 9 of Season 1, Khal Drogo’s “scratch” from his fight with Mago has festered and he lays dying. The parallels between Jon and Drogo in this moment are clear. They’re both scared warriors — with scars, as Vulture points out, around their eyes and their chests — who to fight to protect the people they love. They’re both men who have suffered fatal wounds, only to be saved by magic, although in Drogo’s case, the dark magic left him in a vegetative state. But there’s one thing they don’t have in common, something Dany pointed out right off the bat earlier in the episode: height. “Beyond The Wall” ends with Dany agreeing to fight the White Walkers with Jon and he, in turn,*finally* agreed to bend the knee (metaphorically, as he is bedridden). 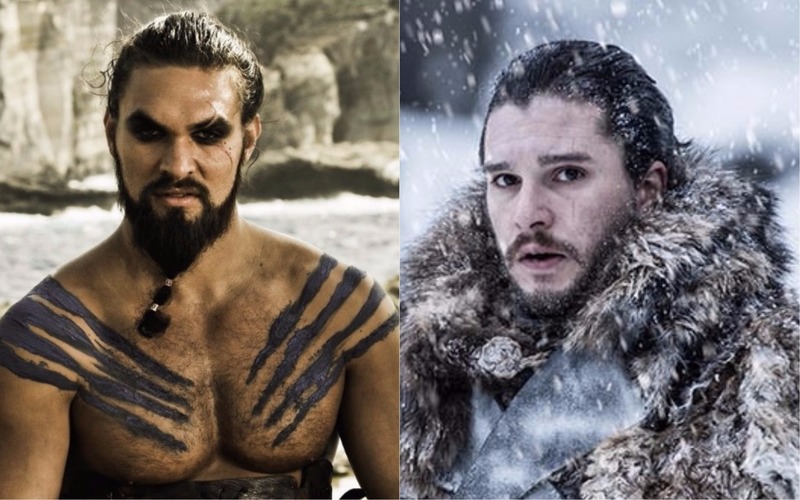 In many ways, it seems that the series highlighted the parallels between Jon and Drogo to remind us how powerful and passionate they both were — for better or worse. Each of their passion and honor, eventually led to their downfall, although Jon got a second chance at life. Something that seems to really impress Dany. The whole scene was lovely and beautiful to watch, but it also seemed to serve a higher purpose. It seemed to be an attempt to undercut Jon/Dany detractors by essentially saying to viewers that of course Dany was going to fall for Jon, as he’s like the shorter, winter version of Drogo — except he lives.